For a unique and entertaining sightseeing experience around Boston Harbor, choose a gourmet dinner cruise - or more casual brunch or lunch cruise. Two large and luxurious cruise ships, the Odyssey and the Spirit of Boston, offer these popular cruises year round. 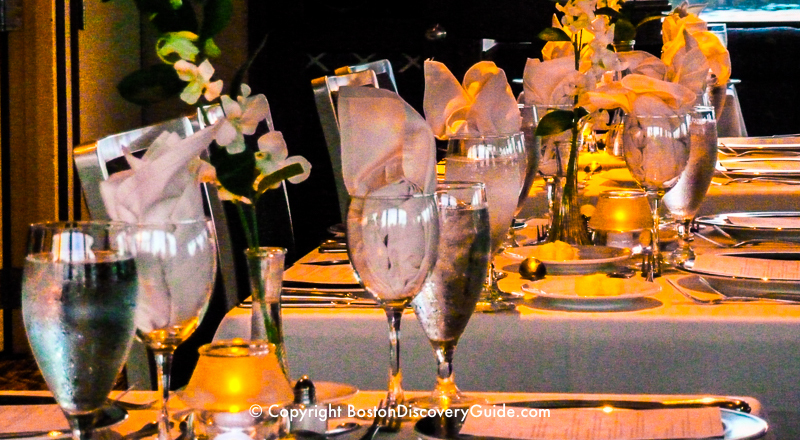 With multiple viewing decks, seating for 600 passengers, and chefs who prepare the food on-board in the ships' professional kitchens, these cruises give you the chance to enjoy the city and Harbor Islands from a unique perspective while enjoying a spectacular meal and fine wine. Dinner cruises around Boston Harbor let you combine a gourmet meal with sightseeing while aboard a from 30 on-board speakers, and the crew's comic routine involving pirates and mutant cod make it the wildest ride in the Harbor. It's a sea monster . . . um, no, actually, it's a souped-up, 2,800 horsepower, twin turbo-charged engine muscle boat. . . well, cruise boat trying to look like a shark . . . or at least not totally like a codfish. 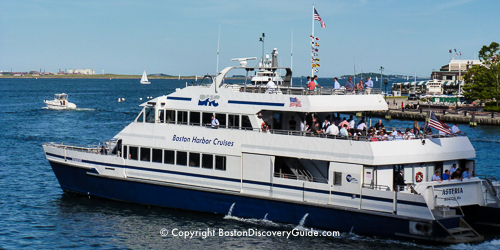 If you're looking for a unique cruise experience that combines sightseeing with fun - and you don't mind getting wet - this may be the Boston Harbor tour for you! Is Codzilla the Right Cruise for You? Yes, if . . .
Maybe not if . . .
Once you come on board, the crew will offer you a free plastic bag to protect small belongings and for a couple of dollars, a poncho to protect you. Accept their offer! During the 40-minute cruise, you'll go as fast as 40 miles per hour, although first, the captain has to maintain a more sedate pace through Boston Harbor due to rules about not creating wakes. You'll see some wonderful views of Boston, and while this isn't a typical sightseeing cruise, the crew points out some of the most famous sites. 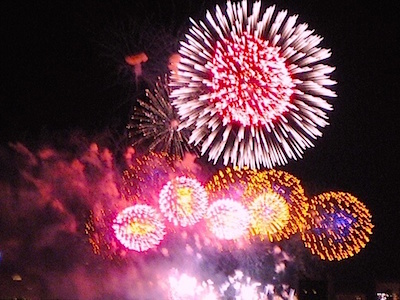 But as soon as you pass Deer Island, get ready to rock and roll! The captain revs up the engine and blasts out AC/DC and other '80s rock music through the 30 speakers on board, while the crew continues their comic routine. You'll feel the wind (and possibly the water) on your face as the captain spins Codzilla around in 360 degree turns and gives you as bouncy a ride as possible by hitting wakes from other boats. Rides vary based on the wind, waves, and wake conditions on a particular day - but if you're sitting in the back, expect to get wet. For a bumpier but generally drier cruise, sit in the front of the boat. 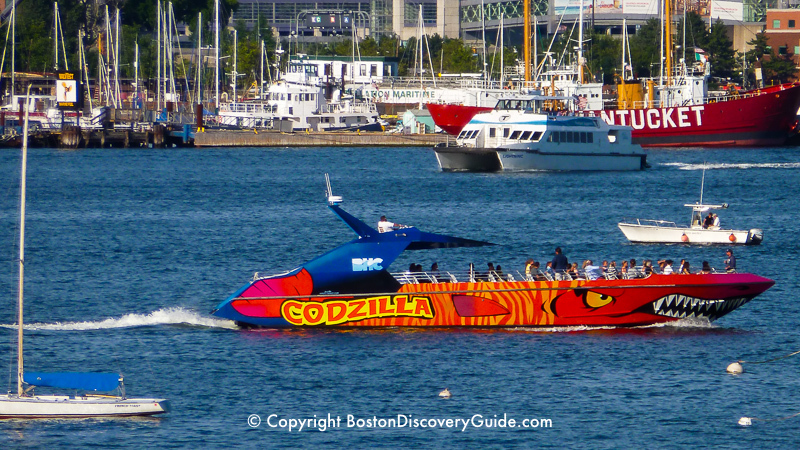 Codzilla cruises depart from early May through Columbus Day (2nd weekend in October) from Long Wharf, next to the New England Aquarium. If you're coming by subway, take the Blue Line to Aquarium Station. Look for the BHC (Boston Harbor Cruises) sign on Long Wharf. What to wear? Dress for a Codzilla cruise with the expectation that you'll get wet...perhaps very wet. Hats recommended? Don't bother wearing a hat or anything else that might blow off . . . even glasses have been known to blow overboard. Sunscreen! Be sure to apply it - 40 minutes on the water can give you a burn. Number of stops during Codzilla cruises: Zero. Does Codzilla operate year-round? No. Cruises take place from mid-spring through late fall, although you can reserve your spot in advance at any time. 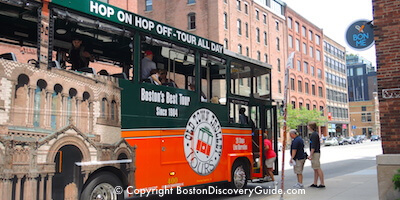 Boston Sightseeing Tours - The best way to see Boston - on land and water!